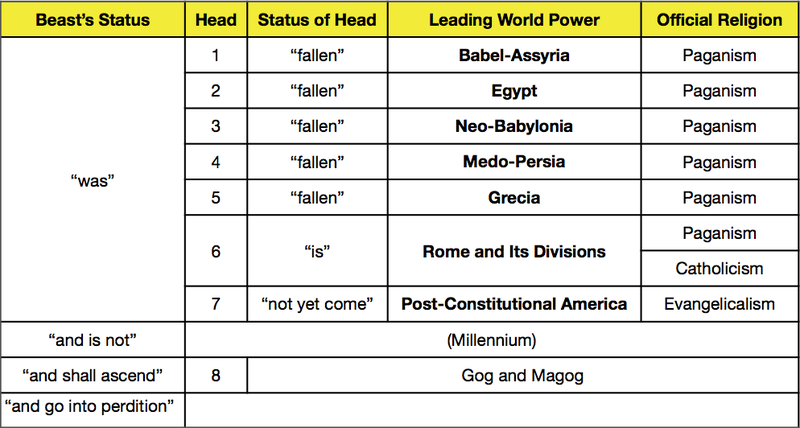 Revelation 17 has been a continual challenge to Bible students down through time. I don't profess to have a perfect understanding of it, but I'll offer some suggestions. Points of discussion include the identity of the beast, its heads and horns, and its rider. I covered the subject of the horns in my October 9 post. As for the woman who rides the beast, her name is Babylon. I discussed the identity of Babylon in my October 17 post. Currently my comments in The Patmos Papers offer three options for the identity of the seven heads. Here I'm presenting a fourth option. The main difference lies in the placement of the "is not" phase of the beast. In The Patmos Papers I was attempting to limit the career of the beast to the time frame of the seven heads. I made no provision for an eighth head. Now I'm viewing the beast as Satan working historically through the various earthly kingdoms represented by the seven heads, himself being the eighth after the fall of all earthly kingdoms. The bottomless pit of verse 8 can be understood to line up with Revelation 20:3. Artists have consistently painted this beast as having seven heads all at the same time. But verse 10 indicates that these heads appear sequentially. I'd like to think that its lion head, for example, was replaced by the head of a bear, which was later supplanted by that of a leopard, etc. "Babylon" as it appears in Revelation is understood as Satan's counterfeit religion, and it has three historical aspects: Paganism, Catholicism, and Apostate Protestantism. 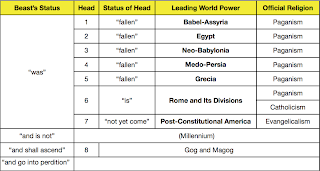 With the woman (Babylon) riding the beast, we identify the seven heads as the leading world kingdoms mentioned in Scripture that carry and endorse the Babylonian religion in one of its three forms. The United States Constitution allows no state-established religion, so America cannot function as a head of the beast until it repudiates the principles of its Constitution. I have identified the sixth head as the power existing in John's day. That's because the angel's words to John in verse 10 are not part of the vision itself, but are part of the angel's post-vision explanation to John. In the vision itself (verses 3-6) John was shown the situation as it would appear centuries afterwards. But when the vision ended, the angel explained things to John from his own first-century perspective. Based on clues from the book of Daniel, I consider the medieval kingdoms as divisions of the Roman empire rather than as a separate head. The Babylonian religion dates back to the time of Nimrod and the tower of Babel. That early Mesopotamian civilization was the first to carry the great whore in her original pagan phase. The first call to come out of Babylon was given to Abram and his family. From that separation we may trace the two lines of religion that ultimately appear as the two women of Revelation. The second world power to pick up the religion of Babylon was the ancient civilization on the Nile. And God had to call His people to come out of Egypt. The third great kingdom was the Chaldean or Neo-Babylonian empire of Nebuchadnezzar. And from that point we follow the sequence of kingdoms outlined in prophecy.